Julien Coudray 1518 is a small, highly exclusive Le Locle based watch brand founded by Fabien Lamarche. The name is taken from one of the most skilled and creative horlogers of the 16th century. In their own words the brand perpetuates a proud heritage through expertise and technology, leaving a legacy thanks to products built to last, wher the tiniest of details shape the design of grand watches. Julien Coudray served as “horologer” to kings Louis XII and especially François I. He played an important part in the flourishing artistic wealth of the French Renaissance and was regarded as the emblematic monarch of this period, significantly contributing to the development of art and literature in France. François I advocated ideas that were widespread in Italy, and even went as far as to commission works by Italian artists whom he invited to France. Leonardo da Vinci worked for him from September 1515 until his death on May 2nd 1519. Being a watchmaker to François I meant having been selected to embody the vision of a ruler surrounded by brilliant and inventive minds. While the royal court was enriched with artists, scientists and men of letters, horologers who united science with art, were highly respected for their exceptional expertise. Julien Coudray is also the first horologer from Blois to be recorded in historical documents. According to historical sources, he is considered the inventor of the portable watch in 1518 in the shape of spring-based movements inserted at the request of François I into the pommel of two of his daggers. 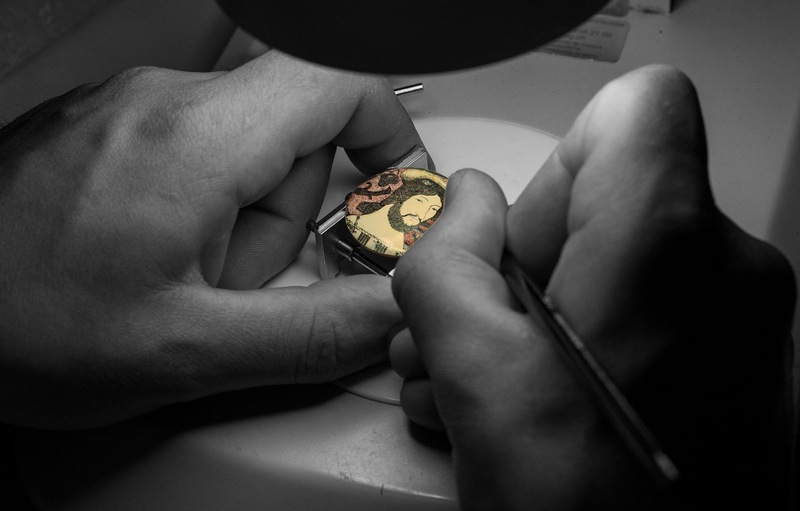 From conception through to hand decoration, from cutting to thermal treatment, from traditional grand feu enamelling through to miniature painting, along with crafting the watch hands and assembling the components, a total of over 40 people representing as many professions, pool their talents in designing, producing and assembling the brand’s entire range of watches and movements. Working with precious metals such as solid gold and platinum, the brand specialises in developing hand-made in-house timepieces performed assembled part by part, component by component. The brand has recently released the first timepiece under their Manufactura Collection in red gold with an enamelled miniature on the dial. This is a numbered masterpiece – a piece unique, 1/1. It represents a permanent quest for authenticity through rare and precious know-how. The “point par point” technique of the miniature was first created by the exceptionally talented M. Petitot in 1630 and the design is inspired by the decoration that the Queen Marie-Antoinette used in Versailles. The detail of the hands as with the dial, are unique and have been manufactured with neither paintings nor chemical treatment. 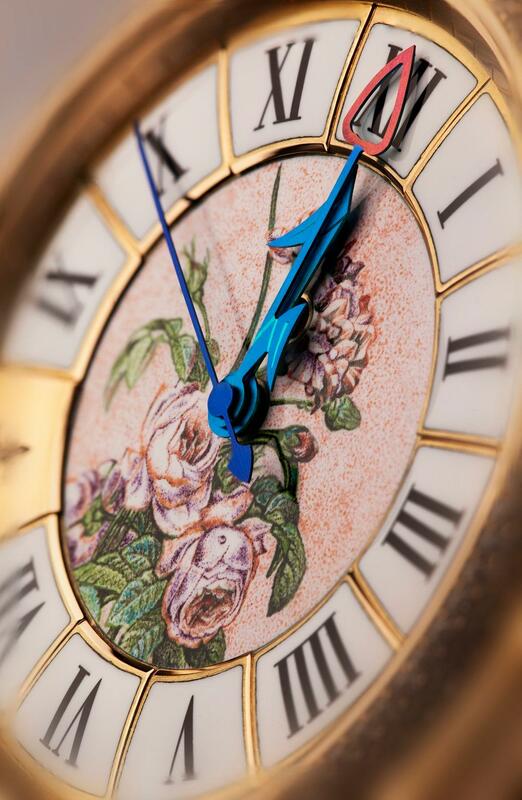 When the hour and minute hands join, they represent the complete flower with its two leaves. Julien Coudray 1518 will be exhibiting at GTE (Geneva Time Exhibition) from January 20th to 24th, 2013 and invites visitors to discover the world of grand feu enamelling at its stand. Indexes made from 18ct 5N red gold and hand painted white “grand feu” enamel. Enamel miniature in the centre – “point par point” technique created and finalised by the exceptionally talented M. Petitot in 1630– design inspired by Queen Marie-Antoinette and the flowers she appreciated in her rooms in Versailles. Unique hands manufactured with neither paintings nor chemical treatment. 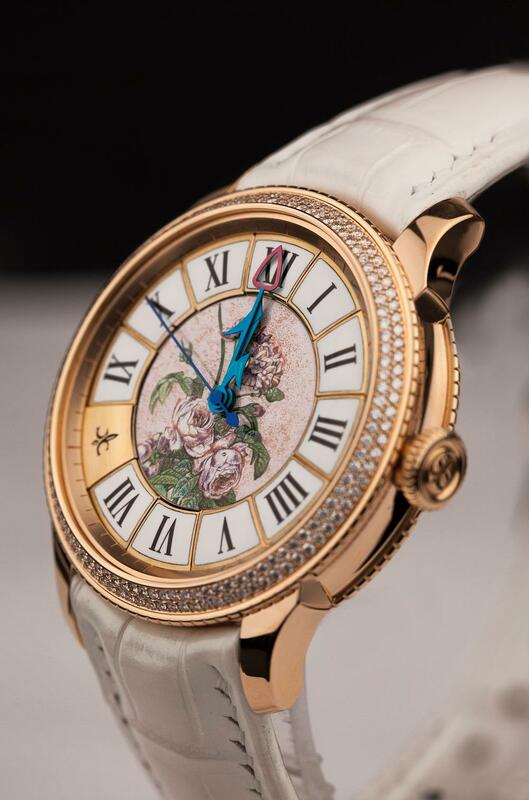 When the hour and minute hands join, they represent the complete flower with its two leaves. « Grand feu » hand painted enamel service indicator at 12 - indicating requested service every 4 year.